The Cattle Egret is a gregarious small heron more often found in pastures and along roadsides than in wetlands. It is often seen following cows, horses, and tractors feeding on the insects that they stir up. Until the late 19th century the Cattle Egret only existed in Africa and Asia. It apparently naturally arrived in northeastern South America in the 1880s and established a breeding population. This population rapidly expanded reaching Florida in the early 1940s and Tennessee in 1961. In the next 50 years it became one of the most abundant of the North American herons, and is now found from Alaska to Newfoundland and has bred in nearly every state. During the winter it migrates to the southern Atlantic and Gulf Coasts, Florida, and southward into Latin America. Description: The Cattle Egret is all white during the non-breeding season, and is washed with orange-buff on the top of the head, chest, and back during the breeding season (March-July). Also during the breeding season, the yellow eyes and bill, and the black legs change to bright pink. The Cattle Egret has a rather short, thick neck and often sits in a hunched posture. Both the male and female look the same. Snowy Egrets are slimmer, have a black bill with yellow near the eye, and black legs with yellow feet. The immature Little Blue Heron is white but has pale greenish legs, and a pale bill with a black tip. Great Egrets are much larger, with a longer neck, yellow bill, and black legs and feet. Diet: Grasshoppers, crickets, spiders, flies, frogs, and moths. Nesting and reproduction: Breeds in colonies with other herons on islands, isolated woods, and swamps. Clutch Size: Usually 3 to 4 eggs, but occasionally as many as 5 eggs. Fledging: Both adults regurgitate food for the young who start climbing around the nest after 3 weeks and are independent of parents by about 6.5 weeks. Nest: The male brings nest material to the female, who builds a bulky platform of sticks and leaves, usually built over water, in willows or dense shrubs. 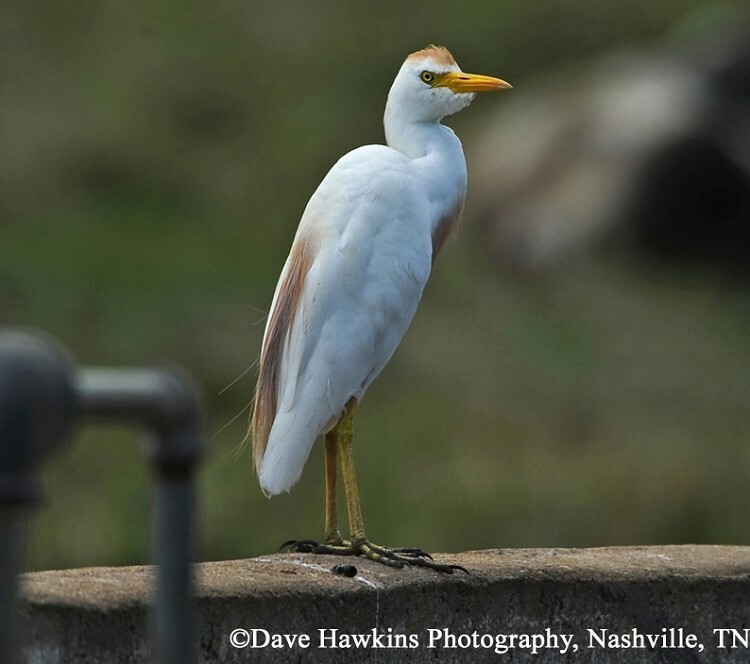 Status in Tennessee: The first record of a Cattle Egret in Tennessee was in 1961 in Anderson County. The first nesting record was of 8 nests in a mix-species heron colony in Dyersburg in 1964. Currently it is a fairly common summer resident in West Tennessee and rare in Middle and East Tennessee. Cattle Egrets arrive in the state in early April and depart by November. The number of breeding individuals and the number of colonies they nest in has varied, but there continues to be an overall increasing trend. Cattle Egrets may compete with native species for nest sites in some areas, but in general, their impact on native species is considered minimal. The Cattle Egret is native to Africa and Asia, and only reached the Americas in the late 19th century. It was first found in northeastern South America in 1877, and reached the United States in 1941, nesting for the first time in 1953. It is now one of the most abundant herons in North American. As they do in Africa, Cattle Egrets often follow large animals (or farming equipment) to catch the insects they stir up. They have even been observed along the side the runways of airports waiting for airplanes to pass and blow insects out of the grass. Cattle Egrets are also attracted to smoke and come from long distances to catch insects trying to escape the fire. Best places to see in Tennessee: Cattle pastures and agricultural fields, occasionally sod farms, in West Tennessee. Telfair, R. C. II. 1994. Cattle Egret (Bubulcus ibis). The Birds of North America, No. 113 (A. Poole, and F. Gill, eds.). The Academy of Natural Sciences, Philadelphia, PA, and The American Ornithologists' Union, Washington, D.C.